This weekend my Dad was visiting and I was a little concerned as at the venue (and time of year in general) it had reported that the Carp had been breeding in earnest. Which often means an unproductive session. Still, I am always up for a challenge and with that in mind I opted for somewhere with plenty of carp but wouldn’t be busy with competing anglers. The choice seemed an easy one and we opted for a few hours at Mangerton Lake. This venue is turning out to be new favourite of mine, with lots of options and lots of species to catch. Unfortunately for my Dad I wasn’t in the conversating mood as I had an absolutely horrible cold. We arrived at the lake and found that aside from a young boy we were the only ones on the lake, which meant we had rich pickings for the preferred swims. I threw a few mixers in but was alarmed to see a relatively still lake surface. Normally the carp arrive quickly and aggressively, but the lake surface stayed very still. My Dad was opting for the fly fishing route with a carp rod and a controller float set up as back up. I opted for a short spinning rod with a controller float, combined with a 7lb N-Gauge hooklength and a size 12 Korum Hair Rig Hook. Eventually the Carp did arrive and within 15 minutes I had missed one and Dad had literally pulled the fly out of the fishes mouth during the take! For the first hour I mainly stuck to the right hand bank, trying to target the carp close in were there was no ripple on the water. The wind however had different and began swirling around the lake. With a constant ripple on the water I started walking around the lake trying to hunt out some feeding fish. It wasn’t long before I found them, the fish seemed to be tucked up in a reedy corner taking surface baits from the cover of the bull rushes. For 30 minutes or more I tried to persuade a fish that my hook bait was the one for it. But every fish eluded me. This was turning out to be a very frustrating day, as by now I would have expected at least 8 or 9 carp. We gave up on the windy corner and walked back around to the calmer section of the lake. I slowly walked the banks throws handfuls of dog biscuits every 10 – 15 meters and eventually I saw a fish consistently rising for the offerings, right in front of me! I lowered my fake dog biscuit on to the fishes nose and with that and grabbed the bait and screamed off! 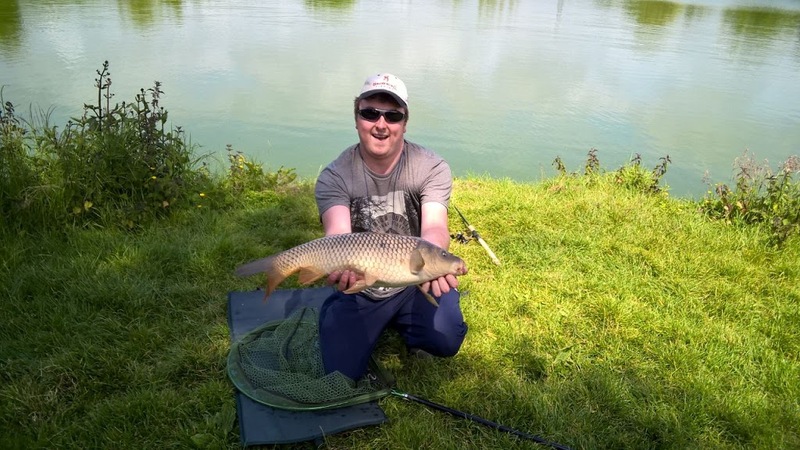 I was in to a lovely Common Carp around 7lbs. I returned to fish to the water and started up again but notice the fish had seriously damaged my line. Dad didn’t seem that keen on continuing either so we decided to knock it on the head mid afternoon and head to West Bay for some coffee. Were we saw scores of Mullet (one of a few pounds which jumped straight out of the water) and various families either crabbing or fishing off the breakwater walls. While down there I saw this fantastic bin. Something I would like to see a lot more of. 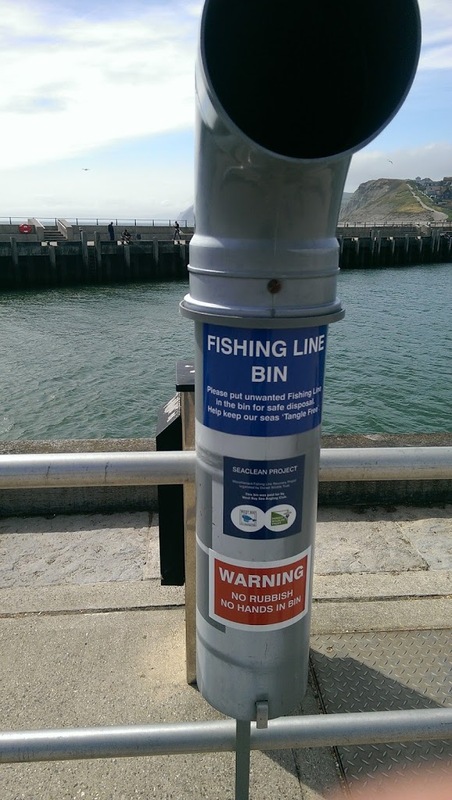 We also called into West Bay Angling to check the tides for the following day as we were going see fishing. So my overall thoughts on fishing Mangerton… I really like the place, but unfortunately this weekend was one which involved more breeding the biting. So maybe I’ll give it a few weeks before venturing out after the carp but for a previous rating when the fish were biting, please click here. Hi, Paul. I sympathize with your frustration about not having to catch as many as you would like, but I could tell that the 7 lbs. carp you caught was worth your trip. And it must’ve been nice just spending time with your dad fishing the whole day. Anyway, good luck on your next trip, and thank you for sharing! Previous story Trip #85 – Bubbling Brooks and Cruising Carp.